We're happy to offer our readers the chance to win a pair of Run of Engagement (ROE) passes for White Boy Rick, starring Matthew McConaughey and directed by Yann Demange ('71). 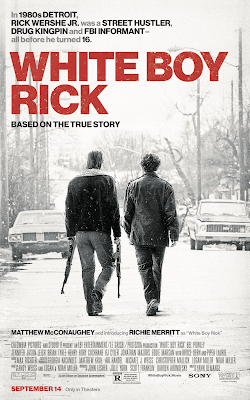 SYNOPSIS: Set in 1980s Detroit at the height of the crack epidemic and the War on Drugs, WHITE BOY RICK is based on the moving true story of a blue-collar father and his teenage son, Rick Wershe Jr., who became an undercover police informant and later a drug dealer, before he was abandoned by his handlers and sentenced to life in prison. To enter, simply send an email to punchdrunktrav@gmail.com with 'White Boy Rick ROE' in the subject line. Include your name, full mailing address, and favorite Matthew McConaughey movie. The passes are valid Monday-Thursday at any Regal Cinema in the DC area, starting Tuesday, September 18. Good luck! White Boy Rick opens September 14th.